يسرنا في شركة صدارة للكيميائيات دعوتكم للمشاركة في الطرح العام لشهادات المقومة بالريال السعودية "الطرح العام للصكوك"
We are pleased to invite you to participate in Sadara Basic Services Company (“Sadara”)’s public offering of SAR denominated certificates (the Sukuk). The Sukuk will be floating rate and will have a tenor of approximately fifteen years and nine months (15.75) years (G) (subject to the determination of amortization commencement according to a fixed schedule). The investors will receive an expected return of six (6) month SAIBOR plus a margin per annum to be distributed semi-annually. The Capital Market Authority (the “CMA”) approved the Sukuk on 13/3/2013G (corresponding to 1/5/1434H). Sadara has appointed Deutsche Securities, Riyad Capital, AlBilad Investment Company and Alinma Investment Company as Joint Lead Managers and Joint Bookrunners for the Sukuk. 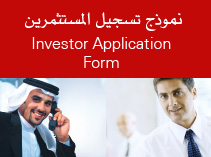 Please note that the offering, sale and delivery of the Sukuk is limited solely to Saudi nationals and those other legal persons with a permanent establishment in the Kingdom of Saudi Arabia holding a current commercial registration number issued by the Ministry of Commerce and Industry.